There are Brazilian myths about a mermaid named Iara. She is a popular character often appearing in parades and festivals. She is very beautiful with shiny hair, green eyes and an enchanting voice. She uses her voice to charm men into the water where they drown. Iara is blamed for boating accidents, the disappearance of adults and children and water-related disasters of all sorts. The natives of Amazonia, the region around the Amazon River in Brazil and Colombia, never go near lakes or rivers at night for fear of Iara. It is said that she has destroyed hundreds of ships. Iara picture courtesay of Genzoman. Click his name to visit his profile. 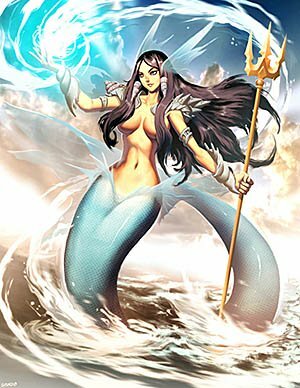 Iara is called the “Mother of the Waters” and may be related to Yemaya and Mami Wata. Many African beliefs were brought to Brazil by slaves. Originally, Iara seems to have been a water snake. In the nineteenth century the water snake legend was combined with the European mermaid. There still are Brazilian myths of a giant snake called Mboiaçu, who is also a trouble maker. At one time Iara and Mboiaçu may have been the same character. Interestingly, the name Iara was made up by the Brazilian poet Gonçalves Diaz. It comes from two words in the Tupi language, "ig" water and "iara" lord or lady. Today, Iara is a popular girl's name in Brazil. I have found this interesting origin myth about Iara that you can read at Not Blue, Nor Red. From Brazilian myths to Legend of the Mermaid.